From Jaguar cars to the Burberry Bags, we have known all the luxury brands through our beloved celebrities. They work hard just to hear the roars of claps, whistles, and reviews in the movie theaters. They are ones who inspire us to stay on-trend, regardless of the event and occasion. Amidst the busy schedule, their heart finds a little time to beat a little extra for that someone special, even they are humans at the end of the day. Despite the whole big fashion glam, they keep their small world separate, where no one can judge them. 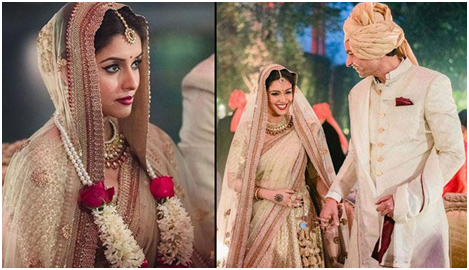 The blog incorporates seven such beautiful actresses who got married to their bae's. Like the way they work on sets, they made sure they worked hard for the big day as well. Right from luxury Lehengas to branded stilettos, the brides left the world awestruck with their looks. Some of them also gave us major fashion goals with their bridal gowns. Read on to know who all stole our hearts smoothly. 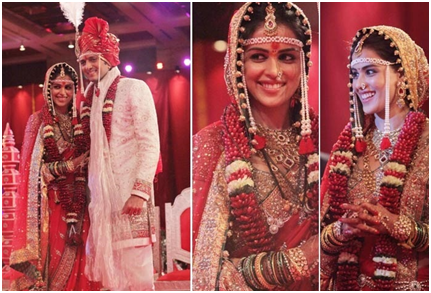 The beautiful Bengali lady got married to Karan in a lavish wedding ceremony. Though our heart aches, but her wedding dress is what that caught our attention. The attire was designed by Sabyasachi which was as beautiful and attractive as her. The jewelry was taken care of by Jaipur Jewels which added to her grace. The “Rangeela” actress who got married in her late 40s has made all the women proud. She is a living example of the saying, "Get married when you are ready, when you really want to and not when the society pressurizes you." 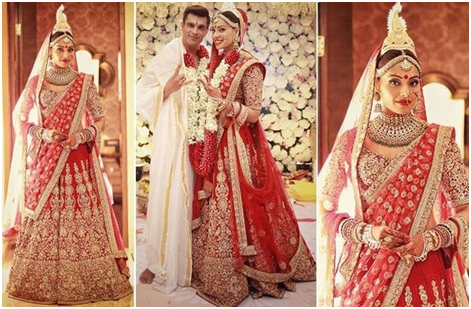 The beautiful lady got hitched to Mohsin Akhtar in Mumbai. Her attire was designed by Manish Malhotra. Manish is the same fashion couture man who designed her costumes for the film Rangeela. "Rehna Hai Tere Dil Mein" is still the favorite movie of many because of the charming actress Dia Mirza and the Chocolate boy, R. Madhavan and the story of course. 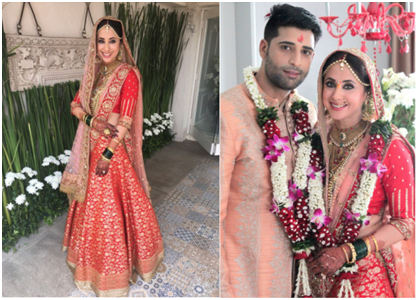 The actress tied the wedding knot with the filmmaker Sahil Sangha. Her wedding outfit was designed by Ritu Kumar which comprised of a kurta, farshi pyjama, and a dupatta. The actress looked as beautiful as a princess on her big day. 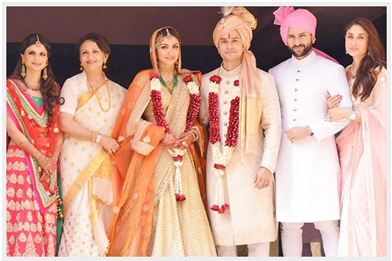 The cute actress took vows with her longtime beau, Kunal Khemu at a private ceremony. The adorable couple was in five years long relationship when they decided to register legally. They got married in the first month of 2015. The elegant lady wore a gold Sabyasachi lehnga which was completed with green emeralds and her glow of course. 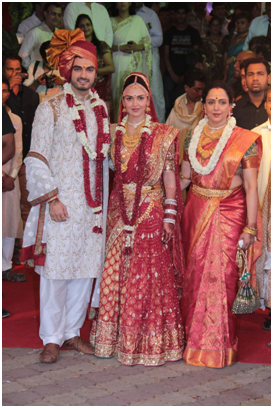 The cute starlet got married to Riteish Deshmukh in a Marathi style. Her wedding trousseau was designed by Neeta Lulla. The saree was just a big ‘wow’ that had a gold Kundan border. Her attire was matched with Maharashtrian jewelry which all together delivered an awe-striking look. Seems like the Ghajini actress took the film to heart by marrying the Micromax owner (the only difference is Aamir Khan was the owner of AirVoice Company while Rahul Sharma is the Co-Founder of Micromax). However, the South Indian actress looked so pretty that the cameras couldn't concentrate on the guests. Her dress was designed again by the famous, Sabyasachi Mukherjee, which was an elegant golden lehenga. The maroon sparkling borders added to the grace of both, the actress and the attire. The "Kya Dil Ne Kaha" lady got married to Bharat Takhtani back in 2012. She wore a bright red and gold lehenga which was designed by Neeta Lulla. The attire was made by combining three heavy Kanjeevaram sarees that were ordered from South India. She also wore traditional temple jewelry in gold to complete the look. Above were some of the actresses who dressed up their best for their weddings, now comes the cherry on top. We also have a special lady who gave us major relationship goals rather than fashion. Read on to find who it is. Talk about simplicity and the first name that pops in the mind is of the 'Vivah Girl'. Probably, this was the one and only Bollywood movie based on arrange marriage. 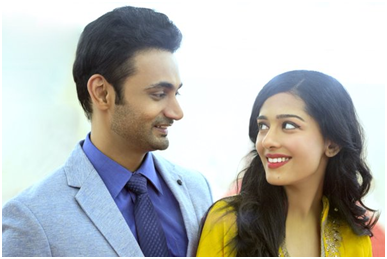 Having starred in the blockbuster like this, the marriage of Amrita Rao should have hit the headlines. But, this girl-next-door chose to keep the entire ceremony a private affair. The only picture that was released in the media showed her in a traditional yellow outfit (probably a saree) adorning her prince charming in black. When every other celebrity was setting their parameters and raising the bar of fashion, this lovely lady has certainly gave some relationship goals. Her It-girl look on the big day is surely an evidence of the fact that marriages are nothing but a connection of two soul. Above were some of the celebrities whom we loved for their wedding trousseau. Hope you liked them as well. If you feel, we left out someone who was equally dashing as the above seven then please leave your comments on the section below.